"You can't like anyone else more than you like yourself." When I heard quote this from a sales and customer relations audio book from Brian Tracy I knew I had to write it down. It's simply profound. It turns out that the best explanations are often the most simple. Regardless of whether or not it is in sales or in your personal life, your self esteem effects the way you do everything and what you even attempt to do in the first place. a realistic respect for or favorable impression of oneself; self-respect. an inordinately or exaggeratedly favorable impression of oneself. A few important words stand out: realistic, respect, oneself, favorable. So with the aforementioned Brian Tracy quote and the self esteem definition, we can gain a lot of insight into what we really can give other people. Namely, we cannot give to other people more respect than we have for ourselves. We cannot like or find others more favorable than we favor ourselves. Lastly, how we view ourselves must be realistic or consistent with who we really believe ourselves to be. Fortunately for us, self esteem can be greatly improved... if we choose to raise it. Otherwise, it can easily fall by the wayside and be left with low self esteem. Brian Tracy has a lot of self esteem self help books and audio tapes. I would highly recommend them, and it's not one of those subjects you have to study for a year before it pays off. Learning how to raise your self esteem pays off immediately. It's certainly an important area for anyone to improve, and like most "real world" skills you simply won't learn this stuff in school or from your boss! You can raise your self esteem! So if you feel like you might have low self esteem or you want to increase the amount of favor, friendship, and respect you can give to others then read a new book, get one free from the library, or try some self esteem exercises today. In my experience, self improvement guru's and teachers across the board denounce taking a daily dose of the news. Whether it be watching the morning news on tv or reading the headlines of the day's paper, it is almost a guaranteed bet that it is negative... and that's an understatement. In fact, I remember hearing Og Mandino say the last thing you want to do when you're feeling depressed is to read the news, because then you'll just feel like crawling right back into bed! This is actually one of the reasons why reading a daily inspirational or motivational blog like this is so valuable. It fills your mind with positive messages, builds your self esteem, raises your self confidence, and if you read some inspirational words it in the morning then it's a positive start to your day. There just isn't enough positivity in this world unless you expose yourself to it. For whatever reason, much of the media world prefers to feed the masses with pitfalls, scandal, depression and suffering. So, first of all, continue reading this blog for daily inspiration and fun articles that will help you become the person you desire to be! Next, if you want a dose of news and some extra inspiring stories then browse on over to Happy News at http://www.happynews.com . Their slogan reads "Real news. Compelling Stories. Always positive." It positively is quite refreshing to see good news, isn't it? This random, interesting quote was one I just heard today after listening to a new audio book from David Allen (big author in the business and productivity and time management area). Allen has had some really good, USEFUL advice on time management systems and skills and good information on simply getting control of our lives personal or otherwise. Anyways, the quote from Aristotle immediately reminded me of Jim Rohn. He often says something just like this quote, along the lines of what's easy to do is easy not to do. I can't help but think he came across Aristotle's words in the past, but I've never heard him quote the Greeks very much. Ol' motivational Jim usually likes to reference the bible and use inspiring parables from Jesus' time. So today, just think about some of those old truths and whether or not you have been searching for the exotic before you've mastered the basics. 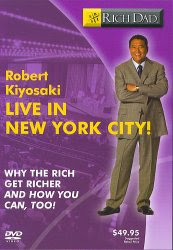 Product Review of "Robert Kiyosaki Live In New York - Why The Rich Get Richer and You Can, Too!" An Informational Yet Motivational DVD. First of all, I should point out that I first was introduced to Kiyosaki via some audio books about real estate and he spoke about why it is a smart thing for anybody to get into. I've become well aware that Kiyosaki has some avid "haters" out there, but still I believe his message is sound and his advice is very valid regardless of whether or not he takes a little "literary license" in his books. I picked up this video because a) it has a nice, relevant title (do you want to be rich too? ), b) I know I have a lot to learn, and c) I've always been happy with Kiyosaki's books and audio tapes in the past. The video is just over an hour and a half long, but it's quick, entertaining, and doesn't drag on. The DVD is 95% a live recording of Kiyosaki at a seminar in front of a large audience. Please do note that it is not one of those corny 20-person faux audiences; those things annoy me! The remaining few percent of Live In New York are short cutaways of Robert talking about and expanding upon what he just proposed in the seminar. The interesting thing about the seminar is that it's ideal for couples to watch because he frequently asks the audience to discuss amongst themselves some particular ideas or questions he poses. Like I said, this makes it nice to watch this with a friend, spouse, or really anyone interested in improving their finances or life. As far as what he actually shares - it's the basics. Those good ol' simple fundamentals! The basis of his message, in my opinion, is that you've got to get yourself educated on all that fun "real world" stuff that they don't teach you in school, and then you've got to simply go out there and make mistakes and grow from it. Of course, if you know Robert Kiyosaki you know he has an above-average presentation. The DVD is funny with some funny one-liners, rat race bashing, and a laid-back almost conversation style delivery. One of the things I got out of it was not knowledge, but simply inspiration and motivation to act. Kiyosaki puts opportunity in YOUR hands by encouraging you to act, thus creating your own favorable circumstances. It's not all basics though, he does bring out members of his personal team including his "boss", lawyer, wife Kim Kiyosaki, and maybe a couple others. They each talk very briefly and simply wet your appetite on ideas like corporations, starting your own business, real estate, investing, etc. All in all, the information he presents is quite elementary BUT that can be the best thing for someone who is clueless about money, finances, or how most people actually get rich in life. When it's all said and done "Robert Kiyosaki Live In New York - Why The Rich Get Richer and You Can, Too!" is a good DVD. It will get you motivated to act, inspired to improve yourself, and headed in the right direction. Kiyosaki doesn't promise anything outrageous like instant wealth and fame (in fact he says it took him and his wife around 5 years together to start making 100 grand a year). I would recommend Why The Rich Get Richer and You Can, Too! to anyone who needs to get motivated, people who need to learn about basic self education, and individuals who understand that repetition is one of the keys to really understanding things. This entry will either be incredibly insightful and inspirational or it will be un-motivating trash. The good news for you, however, is that if it falls into the latter category it won't waste much of your time! Today's blog has far less to read about and many times more to write about and think about. Further, the positive news for you, is that if you take personal development guru and master motivator Jim Rohn's advice and answer these thoughtful, inspiring questions then you can truly improve the person you are. Not only that, you can start your better future right now! So join me, readers, and let's do this. The first question to ask yourself is, Why should you try? Why try to earn more, learn more, wake up early? "Why go through that much?" Next, Why not? "What else are you going to do with your life? You've got to stay here until you go!" Finally, Why not now? "Don't postpone your better future any longer. Get at it tomorrow. Get a game plan going." Do all the things you should have done, all those things you wanted to do, those ones you've been meaning to get to. Have conversations. Anything! Everything! So if you are in dire need of some change, why not look over this list again and build yourself a list of reasons to do better? If you do this right now you won't need to postpone your better future any longer! By being on this personal development web site you are demonstrating that you desire to do what is necessary. By doing the exercises, by answering the questions all over this site, and taking simple steps each day you are stacking the odds in your favor with each day. Keep it up on your good work in this life's journey and elevate yourself! Take a few minutes right now and watch and listen to this song. Connect with the lyrics, and you may see how profound and commonplace many ideologies are, even in pop-culture. We made the grade and still we wonder who the hell we are. "Disappointments are not special gifts reserved for the poor." This is a short inspirational quote about life from Jim Rohn. I find that it is so blunt yet very insightful, just like Rohn says his mentor Earl Shoaff was (Earl Shoaff Quotes)! Jim's quote comes from a speech he gave in 1981 when he was discussing personal responsibility to a small group seminar. Personal responsibility is one of the hallmarks of adulthood - when you take 100% responsibility for who you are and where you find yourself at this present time. So remember, we all have disappointments. It's part of the life experience, and you need to make sure you handle your disappointments and not let them handle you. Get more inspirational Jim Rohn quotes here! Jim Rohn on activity - Results is the name of the game! "Wisdom uninvested in labor is wasted." Both memorable quotes from the influential and inspirational Jim Rohn. One other noteworthy, funny sidenote is that during a lecture Jim Rohn gave when he made these two quotes he said that one of his favorite restaurants to eat at was McDonald's. I believe it was in Tokyo, Japan; and he said it had a great view of the busy city and he would watch all the action out the big window. That's all for today's short little update! Franklin's quote is a crucially important aspect of self-development and personal improvement. When you are faced with the question of how much a book is, how much a seminar costs, or the time you'll have to spend, just ask yourself what is it really worth? In closing and on a very related and wise note, Jim Rohn also said at times that there simply is no alternative to "reading the books." So please, for your good fortune, do not confuse cost with value! How many people do you know that are just waiting for things to get better? Is it more than the number of people you associate with who take quick action when things get negative? Well, in today's world (and I would wager to say in human history) most people are waiting for happiness to stumble upon them. They're postponing it, even if they aren't doing it consciously, and it's causing them to lead a life that is less than it could be. I urge you to take the positive approach - do something for yourself today. Today! Do that thing that's been in the back of your mind for weeks on end, and it will start the process of you living a fuller, happier life. It can be as easy as cleaning off your desk or sending those flowers.